Eleven cities across the United States will receive nearly a million dollars for sustainability efforts that benefit low-income neighborhoods. Greater Cincinnati was awarded the largest grant, which will fund strategic, collaborative activities to prevent, recover, and recycle food waste. The initiative is led by the City of Cincinnati and Green Umbrella. Several Northern Kentucky organizations are members of Green Umbrella, including the Cities of Bellevue, Covington, Ludlow and Florence, the Kenton County Conservation District, Friends of Big Bone and the Northern Kentucky Health Department. The funding is through the Partners for Places matching grants program, which pairs city governments with philanthropy to support sustainability projects that promote a healthy environment, a strong economy, and well-being for residents. Partners for Places, led by the Funders’ Network for Smart Growth and Livable Communities in partnership with the Urban Sustainability Directors Network, will provide $484,000 in funding to 11 cities, which will be matched by local funders. Cincinnati matching funders are Interact for Health, Carol Ann & Ralph V. Haile, Jr./U.S. Bank Foundation and The Greater Cincinnati Foundation. Cincinnati’s funded project will help the region meet the EPA and USDA’s joint national goals for 50 percent food waste reduction by 2030, while improving the sustainability of our local food system. 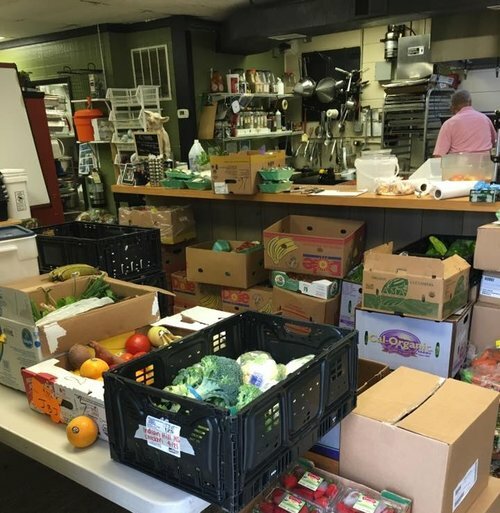 Green Umbrella member La Soupe has rescued over 300,000 lbs of food from the landfill (photo credit: La Soupe). According to the 2016 ReFED Roadmap to Reduce U.S. Food Waste, the U.S. spends “over $218 billion…growing, processing, transporting, and disposing of food that is never eaten…totaling roughly 63 million tons of annual waste.” The EPA estimates that “more food reaches landfills and incinerators than any other single material in our everyday trash” where it produces methane gas, a greenhouse gas that is 23 times more powerful than carbon dioxide. In the Cincinnati region, Hamilton County Recycling and Solid Waste District estimates that 20 percent of landfilled material is food waste. This contributes greenhouse gas emissions equivalent to 57,817 cars on the road for a year. An average family of four wastes $1,500 a year in food they do not eat. Amidst this waste, a quarter of tri-State adults experienced food insecurity this year, according to Interact for Health’s 2017 Community Health Status Survey. This project will complement other efforts occurring in the region, including the City of Cincinnati’s 2018 Green Cincinnati Plan update, current conversations about how to return commercial scale food waste processing infrastructure to our region, All-In Cincinnati, the Greater Cincinnati Regional Food Waste Action Plan, and Green Umbrella’s Waste Reduction Action Team’s campaign to reduce food waste. Lauren Campbell-Kong, co-chair of Green Umbrella’s Waste Reduction Action Team said the amount of waste going to the landfill averages more than 5 lbs. per day. “With food waste making up 20% of our waste stream and with 1 in 4 local residents being food insecure, this grant is a huge opportunity to increase healthy food access while making a dent in the amount of waste going to the landfill,” said Campbell Kong. Other grant activities will include expanding sharing tables in schools, working with institutional kitchens to reduce food waste and recover surplus food, fostering neighborhood composting through policy advocacy, and educating the public on best practices related to food waste issues. Green Umbrella works to maximize the environmental sustainability of Greater Cincinnati, driving collaboration on measurable improvements in key areas of sustainability. For more information or to become a member, please visit www.greenumbrella.org.